Remember Us: The Holocaust Bnai Mitzvah Project is a program inviting children preparing for their bar/bat mitzvah to remember a child who died in the Holocaust before having the opportunity to be called to the Torah. This act of remembering brings one name and one history back into living memory as it gives additional meaning to a joyous occasion. Lighting a yahrzeit candle yearly, etc. To participate in Remember Us contact at HERC@MilwaukeeJewish.org. Students who participate in the program are moving from educational experience to committed Jewish action. They recognize themselves to be significant vessels of Jewish memory, and take their place in the Jewish community by publicly acting as agents of redemption. Parents are often moved to experience their own children offering healing for this broken place in Jewish history. Congregants and unaffiliated bar/bat mitzvah guests become witnesses to the child’s moment of spiritual leadership and redemptive action. 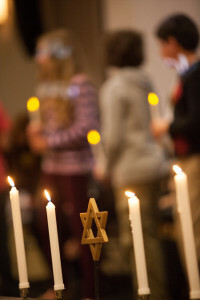 All are given the opportunity for a deeper connection with their Jewish faith and history.